–IN an attempt to unify my woodcut and my painting style I've been experimenting with using a woodcut-like underpainting as a preliminary to my oil paintings. I began experimenting with acrylic markers after trying them out on a public graffiti wall at a conference I recently attended. I found the process remarkably like the woodcut or scratchboard process. I use Golden High Flow Acrylics, in black and white, loaded into empty Montana markers. The markers are an extremely flexible way to draw–I coat the canvas with black acrylic paint before using the markers. The less absorbent the surface the better. I then use the white markers to add the lights and the black markers as a kind of eraser where I can return to the black of the original surface by simply painting over the erroneous white lines. If you want to see how I work in this new medium, I hope you will check out my Instagram feed. 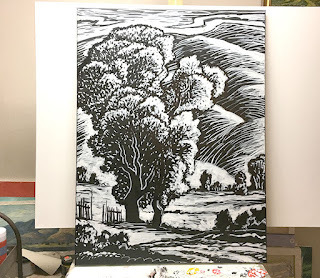 I have several examples of the technique including two videos I posted yesterday of an underpainting (the black and white drawing above) I did for a painting I will be painting today. I've been enjoying Instagram and have found it to be more reliable than Youtube (although all my videos are now back on-line). If you have questions about this new experiment in underpainting I hope you will feel free to comment either here or on Instagram.